I know I’m completely off-season with this post, traumatologist but as I mentioned last week, hemophilia I just got a grill for Christmas and am slightly obsessed with it at the moment. So, please pardon my seasonal inappropriateness, but January really is the perfect grilling weather in Miami! And nothing says Miami or Cuban food like guava, so it’s just natural that when I get a grill, I think to make guava BBQ sauce. 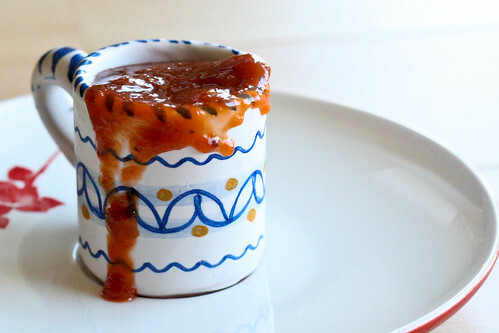 Some of you may think it’s weird, but everyone’s heard of peach BBQ sauce. This version has the same sweet flavor with a little tropical twist. Since I use canned guava shells and guava paste, this also makes it an all-season sauce. Pork chops and pork tenderloin are especially yummy covered in guava BBQ sauce, but chicken and turkey taste pretty darn good, too. Grill, broil or sear for a caramelized, sweet and tangy taste that will make you feel like it’s summer already. Heat a medium sauce pan over medium heat. Once it’s hot, add the oil and onions and saute for about 5 minutes, or until soft. Add the jalapenos and garlic and saute for another minute. Add the remaining ingredient and bring to a gentle simmer, then reduce heat to low. Cover and simmer for 20 – 30 minutes. Remove and let cool. Store in an air-tight container for up to one month in the fridge. Oh, what I wouldn’t give to be in Miami. It’s twenty one degrees here. Seriously. This sounds good, barbecue sauce with a nice twist! I would definitely go for pork chops with this. maggie – Sorry about the weather :( I was up in Michigan for 10 days over the holidays and it was definitely chilly! Where are the homemade chicken nuggets when you need ‘em? Oh my. There’s something really enticing about that messy drip shot! This would be perfect with grilled chicken cutlet. yuMMy! Question: I happen to think that guava goes quite nicely with heat. Did the jalapenos add enough kick, or do you think it would be worthwhile to substitute a single habanero for the two jalapenos? is this the same as the pollo tropical sauce?? kaitie – I’ve never had the pollo tropical sauce, so I’m not sure. Fantastic goods from you, man. I’ve realize your stuff previous to and you might be just very exceptional. I truly like what you’ve got acquired here, undoubtedly like what you’re stating and the way in which you say it.moncler coats review You make it entertaining and you still take care of to keep it wise. I cant wait to read much a lot more from you. This is actually a fantastic site.